Key difference: Snowboarding is a winter sport where the participants ride their snowboards over snow slopes. Skateboarding is an action-adventure freestyle sport, which the participants play by riding their skateboards and performing stunts. According to Wikipedia, "Snowboarding is a winter sport that involves descending a slope that is covered with snow while standing on a board attached to a rider's feet, using a special boot set onto a mounted binding". Snowboarding is as simple as it is fun, and its rules are really easy too. To snowboard, all one has to do is get on the snowboard and go down snow-covered slopes. However, beginners do require professional assistance while attempting this sport. Reason being that this sport is based on body kinetics. While riding a snowboard, one must keep his/her balance intact at all times. Although balance can be ensured through bindings at the toes and heels of a snowboarder, he/she must also sustain a set of correct body postures to avoid tipping over. There are many types of snowboarding executed at various international events and sports festivals regulated by the FIS, Internal Ski Federation. Out of these variants, the freestyle, the alpine, and the boarder cross styles are most popular. The alpine style is all about speed and maneuvering the board, while the freestyle is an open platform for showboating and performing dazzling tricks. The boarder cross style closely resembles the Motocross X racing, where the participants have to get to the finish line by overcoming strategically placed obstacles in their path. 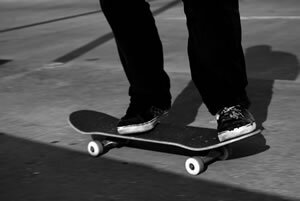 Skateboarding means to get onto a wooden board with wheels at its base, called as a skateboard, and riding it along the ground, with or without performing tricks. Skateboarding first came into existence in the run-up to the 1950’s. Ocean surfing was a very popular sport and leisure activity then. However, the surfers couldn’t do it all the while, as ocean waves flattened up after some point of time, as they always do. This made surfing unfeasible. Hence, the surfers in California came up with the bright idea of attaching wheels or roller skates to the base of their surf board, in order to turn it into a skateboard and perform skateboarding. After its fascinating inception, skateboarding has emerged to become a raging cult among the masses. In fact, so much so that specially built skate parks have sprung up worldwide consistently since the 1970’s. Skateboarding is not only carried out as a professional sport, but it is pursued as a job or used as a medium of transport as well. To skateboard, one must retain his body posture well and maintain uniform balance throughout. Another integral part of skateboarding is the foot stances. There are two types of stances namely regular and goofy. Regular stance is when the rider’s left foot is at the front of the board, while goofy means to have one’s right foot at the front. Both of these two stances have the sub-styles of regular, Ollie, fakie and switch. In particular, Ollie is an extremely famous skateboard maneuver, which was the brainchild of Alan “Ollie” Gelfand, the legendary 70’s skateboarder. Additionally, an interesting point to note here is that snowboarding and skateboarding are highly analogous to each other. Both the sports involve riding on boards, maintaing body postures throughout the act, similar weight shifting techniques, similar braking sysytems, etc. Moreover, some of the stunts that the athletes of both sports perform are also similar. The kick-flip, the switch-flip, the 360, etc. are the notable examples that could be cited in this case. Snowboarding is a winter sport where the participants ride their snowboards on top of snow. Skateboarding is an action-adventure freestyle sport, which the participants play by riding their skateboards and performing stunts. Normally, skateboarding isn’t practiced with bindings. However, exceptions are duly made in the case of beginners.